Discussed how to set up a pricing form so that a thumbnail associated with a selection list item will appear or change depending on the item selected in a list. Create a thumbnail of the image you wish to show on the pricing form. Be sure to create the thumbnail with the size as close to the image to appear on your pricing from - E.g. 1 in x 1 in. and save in jpg or png format. Be sure also that the image file is accessible to Control and whatever “clients” might be running Control – i.e. is in a shared folder with appropriate access permissions for all your users. For best results, we think the images should be on the same drive as Control. Name the link descriptively. 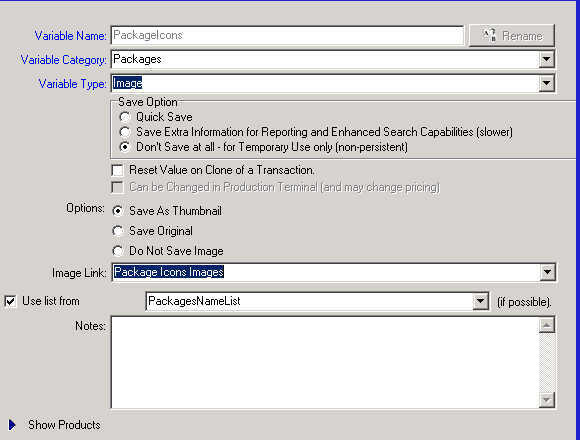 In the Screen Shot below, we have named it Package Icons Images. You can view your Image Links by expanding the Properties list at the bottom of your list as shown in the Screen Short. For each row in your list, select the “Browser” button in the Image column, find and select the image you wish to associate with that row. Note the selection in the screen shot below showing the full path and name of the image selected. Create an Image Variable by creating a new Variable and selecting the type “Image” as shown in the Screen Shot below. For the Image Link enter the name of the Image Link Property in your list. For the List, check the box “Use List From” and select or enter the exact name of the selection list containing your Image link property. Under the Tab marked “Other” select “Designer Thumbnail”. Place this on your form and size it as you wish. 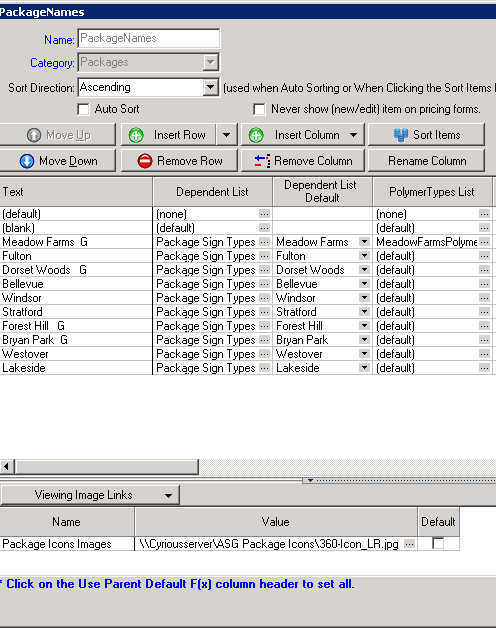 In the Property for Variable enter the Image Variable name you have created to retrieve the Image link from the Selection List. You can see this in the Screen Shot below where the Variable for the Designer Thumbnail widget shown in the lower right-hand corner is entered as Package Icons.